Letters / Let's play LIFELINE! When last we corresponded, I had determined that my guinea-pig-sized skein of Blue Heron cotton was to meet its destiny as a lace shawl, specifically Kiri, a 100% Free Pattern (yay!) designed by All Tangled Up Polly. Well, I ditched the whole mess and started over, using size 6 (4 mm) needles instead of size 7. Much tidier, I must say. But incredibly enough, at the same place in the pattern that I screwed up before, I screwed up again. But this time, I was eight repeats into the pattern. Too much to ditch and start over. So. I recalled The Voice of Wisdom, who a long time ago wrote about the way to rip out lace without ripping out your hair. Step 1. Stare at the six messed-up stitches for two hours. Try a few k2tog-yo-don’t slip the stitch off the needle-yo-ks just to be sure a miracle doesn’t happen. (It won’t.) Realize that you have irredeemably screwed up. Step 4. Use a tapestry needle and some yarn (Patons Grace is excellent for both lifelines and trussing a chicken), thread your way through the Good Row. Pay attention that you catch every stitch (even the k2tog pssos). If you drop a stitch, well, just don’t do that. The good thing about following a row of stitches this way is that you might even learn something about the way your pattern is behaving. Or. Not. Step 5: Enjoy the rare pleasure of yanking the needle out of your knitting. Wallow in the alarming sight of loose stitches dangling in the wind. Thanks, Emma, for this lifesaving technique. Anyone who wants to share their lifeline experiences, please do. We are developing a reality program in which people fix their terrifying knitting problems on live TV. How beautiful is the Kiri in the Heron of Blue! For me, stitch markers would be part of the problem, not part of the solution. But that’s just me, lacking dexterity in the manipulation of small objects. Hey guys! When I knit lace, I use dental floss for a lifeline and will run it through all the stitches on the needle and then knit for a while. Eventually, I’ll pull it out (why I like dental floss for this – thin and slippery!) and run it through the stitches on the needle again. For me that’s easier than doing it after the stitches are off the needle. With two Kiris under my belt, why didn’t I think about that? I like the dental floss idea. I actually got very, very good at un-knitting. I would just methodically go back stitch at a time across a row. But I also counted my stitches on each pattern row (ignoring the purls). I didn’t really have anything for the lifeline that wouldn’t get caught to the lace mohair. Great ideas! Not to jinx you, but if you left the lifeline in, wouldn’t it be nice to have it there should you need it again? That was a nailbiter. I wouldn’t have gotten past the part where you sit there staring at all that ruined time and womanpower. That pattern in that yarn is lyrical. Does this amazing lifeline work for any project? Hi, first time commenting here. Love your blog! I’m working on the Flower Basket Shawl, and as it’s my first real lace project I place a lifeline at the end of each pattern repeat (10 rows in this case.) I simply thread it through the stitches just under the needle then keep knitting. I’ve only used it once, but knowing it’s there is nice. I use lightweight crochet cotton that is not too thin, but slips easily through even fuzzy stitches. Your Kiri looks lovely and I’m looking forward to trying it next. I use the dental floss thing too, except that I intentionally put it in every couple pattern repeats or so, before I screw up, which with lace I will almost certainly do sooner or later. When I get to something that I just can’t fix, I rip back to the last lifeline and there I am. Less swearing all the way around. When you do the ripping-out lace segment on your reality show the yarn should have high mohair content. That’ll give it a good edge of your seat feel- can the knitter get the stitches removed without hurting someone or herself? Will she patiently work through the place where the yarn has seemingly knotted to itself, or will she break the yarn? How will the yarn hold up? Plus, the endless counting and recounting between stitch markers to find out exactly where an error in a pattern is- that will have viewers enthralled! Ann – Thanks so much for your brilliant after-the-fact insert-lifeline-from-rows-long-past action! I’ve been knitting lace and TELLING myself to follow the advice of those above (insert lifeline every couple of repeats, just going through what’s on the needle, also known as THE EASY WAY), but now…I can’t tell you what a relief it is to think that if I’m too lazy or having too much fun with the knitting to stop and take advantage of THE EASY WAY, I can at least take the not-quite-as-nerve-wracking route. Although, yeah, with mohair… counting every damn row, because unknitting every stitch is the only removal option. How does it feel to be my new forget-the-lifeline-until-you-need-it enabler? See ! It didn’t hurt a bit ! 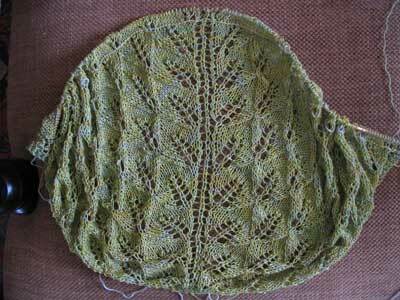 That shawl is looking very beautiful indeed in the Blue Heron.I just happen to have a luscious hank of it ! Just need some time. Very cool tutorial Ann. I’m not much of a one for putting lifelines in as I go and when I messed up Birch (despite the sweet little stitch markers) I was just counting and counting and looking and looking and figuring (Great live TV I feel). Finally managed an approximation of what it should have been but now I’ll know what to do for next time! I also love the shut-the-door-after-the -stitch-has-bolted lifeline idea – but I’m so lazy, I use a very fine circ. as a lifeline – then I can just knit the stitches back off it. May you have a fine Patricks Day, and may your Knitting continue to be a little piece of heaven here on earth. Buttonhole Bag Question: That bag is adorable, and I must have it. Did you use a double strand of Bulky in the entire bag, or just on the bottom. thanks for the great lifeline tip – the photos helped alot and your explanation was very very understandable. 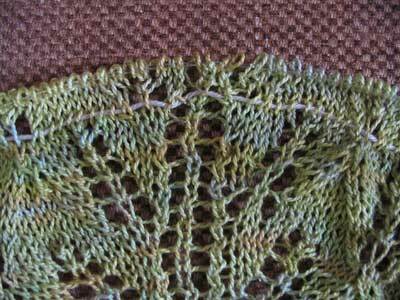 I don’t know much about you yet…..I’ve been longing to knit the Kiri as my first lace project…your lifeline hint before I start is a winner. My main fear of starting this project is that I have a 3 nad 4 year old! I just think it isn’t the time for something that takes serious math, attention, stitch markers and all. But oh the pix of everyones are so beautiful. Thanks for sharing.